Draw a straight line to the south coast and that’s pretty much our route for day one of an amazing three day trip. Nine of us set off from Covent Garden just after 2pm on Friday 13 July and made our way to the bottom of England. Supported along the way with water, food and good cheer from Glen (@aeightracer). After a long slow slog through London (about 30km) we enjoyed quieter roads and pretty villages, and all the while we were contemplating the thought of Ditchling Beacon… This climb sat between us and dinner so we had no choice! It is #22 of 100 infamous climbs in Great Britain, and featured in the 1994 Tour de France. It was a bit of a brute, but the views over the South Downs were fantastic and so worth it. And food never tasted so good in Rottingdean before our ferry from Newhaven to Dieppe. Those onion rings! We were all definitely ready for our cabin beds by 11pm when the ferry departed for France. After five hours on the ferry from Newhaven to Dieppe, and approximately zero hours sleep, we set off at 6am on our bicycles, slowly and quietly. I bored anyone who would listen how much I was looking forward to coffee, wherever and whenever that might be. After two cold but peaceful hours on the traffic-free Avenue Verte, and a pretty sunrise over the hills, we stumbled across civilisation in the form of a lovely little village called Neufchâtel-en-Bray. We found an open patisserie and consumed beaucoup de pain au chocolat. I went on a coffee quest and upon finding a man with a coffee machine exclaimed without hesitation “Je t’aime!” He looked happy at this, and I too was happy. Win win. On we went, buoyed by coffee and pastries towards our big chateau in rural France. We passed other touring cyclists on their way to see the Tour de France, and we were all getting quite excited. After a couple of hours of rolling hills, corn fields and the odd sprint to keep ourselves awake, we arrived at our lovely house with a big garden containing a hammock, BBQ and apple trees.Quick face wash and chilling of some beers, and we jumped back on the bikes to track down the Tour de France. We weren’t alone in doing this. 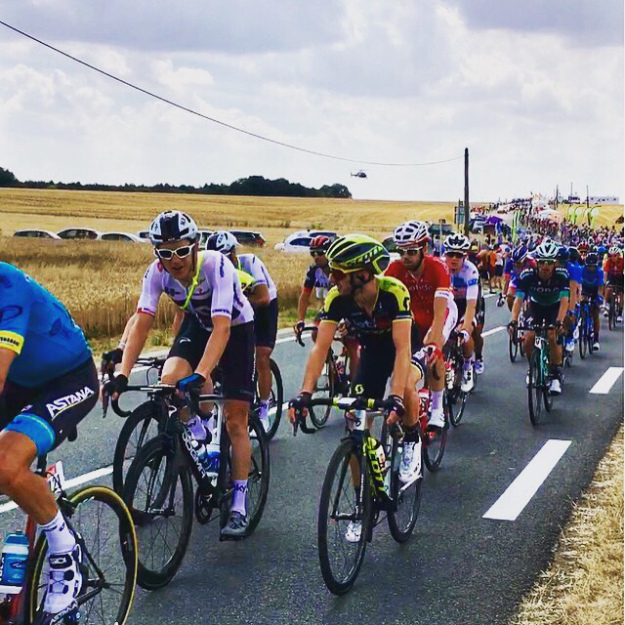 There were hundreds of people lining a quiet road in France and the atmosphere was amazing. First the sponsor cars rolled through, casting presents to the crowds. After two hours of waiting, and me practicing my rusty French on nearby families, we saw the two breakaway riders crest the hill. As they passed us they were grimacing with effort. Shortly after, the massive peloton came snaking down the hill towards us. In just 39 seconds they’d been and gone. Whoosh! Back to the house to relax, drink beer, award prizes and eat large quantities of pasta. A good day indeed. Wow, what a day to remember! And not just the moment Euan and I sang Rhythm is a Dancer (badly) while cycling through the French countryside! But more the sense of achievement of finishing our epic adventure in Paris. Special credit to our amazing one man support crew Glen who made the trip by keeping us fed, hydrated and reassured along the way (photo credit to him and his climbing skills; this cracker is from the top of his van! @aeightracer).The first 50km of our final day were spent on smooth, quiet lanes and it was so lovely and warm. It’s the kind of riding cyclists dream of. We seemed to whizz along at a good pace and before long we arrived at a lovely bridge over the River Oise and stopped for a photo shoot. We met Glen just after for a well earned coffee. Then the 40km run into Paris through various towns. On entering the Forest de Saint-Germain-en-Laye, I’m not sure any of us were quite expecting miles of gravel paths. I loved it, but I’m not sure the others were so fond!We continued to meander our way ever closer to Paris with rising temperatures. After plenty of traffic lights and roundabouts we were finally riding down towards the Arc de Triomphe. Very cool. And quite emotional. A lot of good vibes and €10 Euro pints later, and the others had dispersed off for their Eurostar home. Sandy, Euan and I were left alone in Paris with what can best be described as total World Cup mayhem. I am so glad they won!! As we sat eating ramen and drinking Japanese beer in a lovely small restaurant near our hotel, we were so distracted by the exuberant football celebrations that the three of us didn’t get a chance to relive our three day adventure or reflect on what we’d done. It’s been so important to me to capture it all before we forget and the memories fade. Temperature | 35 degrees C+ !